2018 Hauser Soccer Team. Photo courtesy of Andy Hunnicutt. I arrived late at the Hauser soccer game against Morristown. We were up 1-0 early with the score remaining that way at the end of the first period. Soccer is a game of skills I have never been able to master despite presenting the game in physical education classes at Hope Elementary years ago. And, I admittedly have never been inspired to run as much as the game requires. I was quite impressed with the skill level of both teams as well as their fitness. I had to leave early in the second period to catch the volleyball match and took a route to Southwestern never tried before due to the closure of State Road 9. Like me, I am sure others are intrigued and frustrated by the construction sign that states to find an alternative route. It causes all kinds of problems for a directionally impaired driver like myself. Fortunately, I did not make any wrong turns and arrived just in time for the volleyball match. There was much pink due to the focus of the event being for a very worthy cause, Cancer Awareness. We won the first set 25-16 with Southwestern missing too many serves. The Spartans served much better afterward and won the next two exciting sets 28-30 and 23-25. I have been in such matches as a player and know it is not easy to swing the momentum the next set which we did and won 25-23. It is even more of a challenge to win the fifth and deciding set to 15, especially when falling behind, but we did winning 15-11. I was impressed with both teams as they played with much hustle and heart! It was to be expected due to both being undefeated in the Mid-Hoosier Conference. While at Southwestern, I looked up in a high corner and spotted Dave Newland, a friend who is quite passionate about the game, scouting for Trinity Lutheran's coach, Faith Wilder Newland. (I had the pleasure of working with Faith when she played for Jennings County when they finished third in the 1980 State Volleyball Tourney.) Dave reminded me that Hauser would be playing Trinity Lutheran there on Thursday, two schools with great programs and a history of competitive matches over the years. In the meantime, I called Andy Hunnicutt, long-time Hauser soccer coach. (By the way, he can play volleyball too!) He informed me that the Jets were able to score one more goal while holding the Yellow Jackets scoreless to win 2-0. Earlier, Hauser had also defeated Morristown in a very close shootout after another game with them had been suspended due to darkness. When the night was over, we had won the Mid-Hoosier Conference for the first time in that sport. Congratulations! 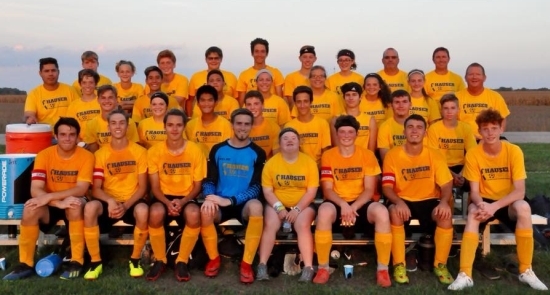 Then, Coach Hunnicutt shared another one of those great stories about how there was a Down Syndrome Awareness Game that I had missed that same day but could catch on a video by Becky Fisher Hunter. It features Becca Hunnicutt as well as the Hauser and Morristown players, the officials, and the announcer. Becca has been the Hauser Team Manager for almost 8 years, and she was given an opportunity to display soccer skills she has gained in that capacity. Kick after kick went toward the goal with the final one being a score for Becca with a celebration by all afterward, an evening which a sport captured another beautiful moment. Over $200 was collected and will be proudly presented to the Columbus Area Down Syndrome Support Group during the Buddy Walk. On Thursday, I visited my family in Lovett in the afternoon and later made a cross-country drive across the Weston Bottoms to Trinity Lutheran. (Thankfully, there was not any flooding in the area with permanent warning signs suggesting it could be troublesome.) I took a side trip to one of my favorite restaurants off of State Road 50 in Seymour, Bonanza Steak & BBQ. After arriving at Trinity Lutheran and watching warm-ups, I was concerned about us being able to control the net due to their height advantage. However, the Jets battled the #5 state ranked 1A Cougars quite well, which is not surprising considering this team's character, but they prevailed 15-25, 14-25, and 23-25.